i have never seen a crazier looking vegetable than this one. 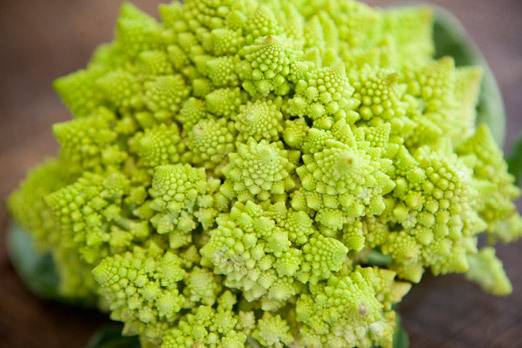 so i ignored romanesco for awhile, i dismissed it as a veggie trend with all of it’s neon coloring and psychedelic shapes- too fancy for this girl. but yesterday, i broke. i bought a head. it was sitting next to some purple cabbage and i had some oprah aha moment where i pictured it mixed into a stir fry all colorful-like. and i knew, we’re going to be friends, this bizarre vegetable and I. and so we are. it’s delicious, and funky and has a great texture. i’m a fan, romanesco, i’ll stick with you even when neon isn’t cool anymore. prepare forbidden rice (i rinse thoroughly and then cook 1 cup of dry rice with 1 1/2 cups of water in our rice cooker). this can be done in advance or be cooking while you’re prepping the veggies. heat sesame oil in a wok over medium heat. add onion, ginger and garlic and cook for 3-5 minutes minutes. the onion should be softening. add romanesco broccoli, one tablespoon of shoyu and the juice of 1/2 of the lime. mix it all up, cover and cook for 2 more minutes. add cabbage, one tablespoon of shoyu and second half of lime. cook until the cabbage and romanesco are to your liking (I prefer a little crunch, but cook longer if you like a softer stir fry). 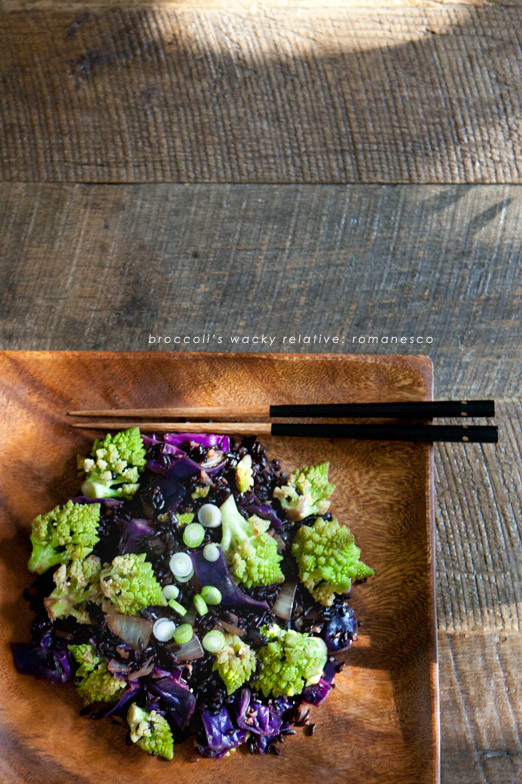 When veggies are almost to your preference, add forbidden rice and one final tablespoon of shoyu (taste first and omit if you prefer it with less shoyu). I also add a few squeezes of siracha for some heat! garnish with green onions. serve to amazed friends and family & enjoy! What I can't get over is the color! It looks like art. I may have to be adventurous like you and give it a try! The colors are so gorgeous together! I've always been a little afraid of romanesco too, but maybe I will give it a try. I am going to have to try this vegetable out! 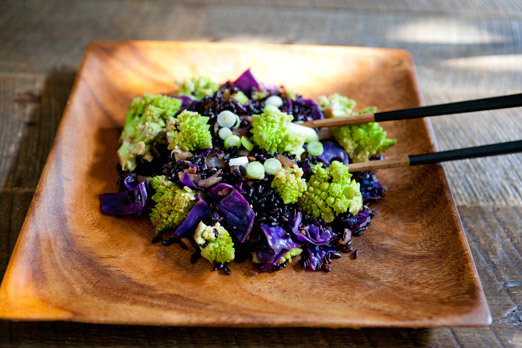 The recipe sounds great with the forbidden rice Thanks so sharing. Oh man, typos galore. *Thanks for sharing. right, I wont lie, I dont like anything on it, but just because it looks pretty amazing I would probably give it a go! 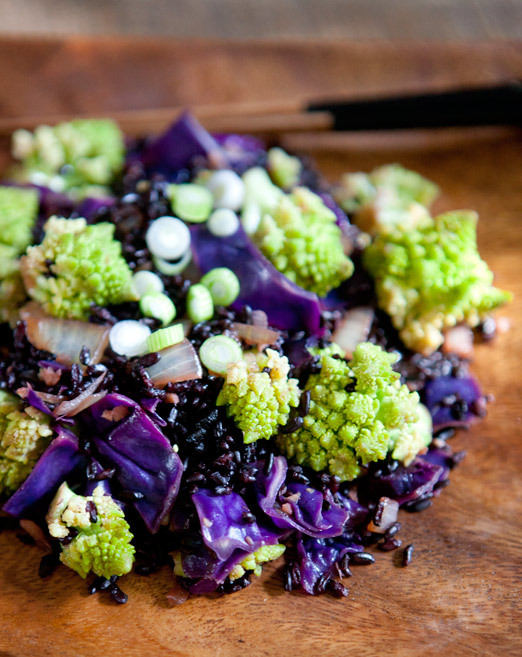 There's something about the fact that romanesco has been paired with forbidden rice in this dish that makes the whole thing just feel a little naughty…but in the best way possible! I just came across your blog via pinterest earlier this morning, absolutely love your photographs they are beautiful! Well, I can kiss goodbye a productive Friday morning! This looks delicious, you're so creative!! Where are your plates from? They're beautiful. This was absolutely delicious! I made it with quinoa. Beautiful! I happen to have all the ingredients, so I think I’ll give it a go. Can’t find how many servings or total prep/cook time though? Thanks!